Though a self-proclaimed fantasy fan, aside from A Song of Ice and Fire, I haven't kept up with the new epics that have been published in the past decade or so, despite owning a handful of fantasy bricks that met critical acclaim. Over a year ago, I read a story online of a couple who, facing a power outage, read "The Name of the Wind" aloud together by candlelight, alternating by chapter. I decided to try this with Kyle, absent the power outage, over winter break. It was the perfect novel to share, ripe with intrigue, twists, gasp-worthy moments, and bits of foreshadowing ripe for speculation and discussion. In a quiet town, and innkeeper mostly keeps to himself as he waits to die. The world around him seems to be struggling with hints of dark times and darker beings lurking in the future. When a scribe passes through, he implores the innkeeper to share his life story, suspecting the simple innkeeper is more than meets the eye. Kvothe agrees, setting the stage for an epic story within the tale of their meeting at the inn. Kvothe is the son of traveling performers, and he lived happily on the road with his family's troupe, learning quickly and voraciously until tragedy befalls his family. He is left alone to survive, eventually making his way to a university of magic. There, survival is as precarious, if not more so, than when he lived on the streets. Above all else, he is driven to uncover what killed his parents, and why. Kvothe's tale is filled with adventure, mystery, and a lovely bit of romance waiting to be further developed in later books. It's also a great book for reading aloud, with simple, clear prose that still has a few clever and charming turns of phrase. Rothfuss has committed himself to three, and only three, books for the series, though there's already an extra novella. I am now a firmly committed fan, and can't wait to start "The Wise Man's Fear." Verdict: Affirmed, for fans of fantasy, epic fantasy specifically, or anyone looking for a long book on a cold night. 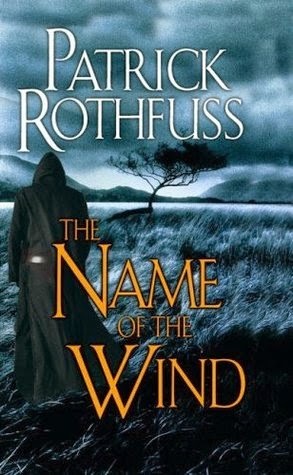 "The Name of the Wind" by Patrick Rothfuss, originally published March 27, 2007 by DAW Hardcover.